Did you know Rocket League is a sequel? If you’ve heard of 2008’s Supersonic Acrobatic Rocket-Powered Battle-Cars, then the answer is probably yes. 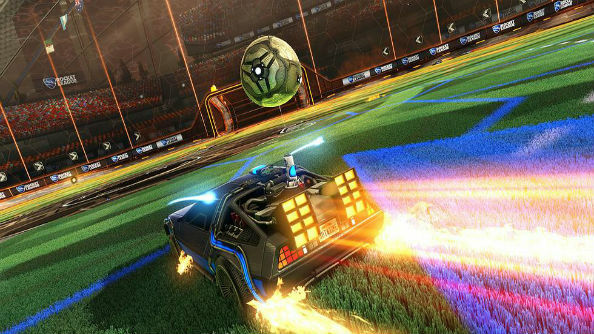 If not, you might be surprised to know that over two million people downloaded the now eight years old PS3-exclusive and forerunner to last year’s cars-in-a-cage slant on football that launched developer Psyonix into stardom. More cars less football? Check out the best racing games on PC. Let me be frank with you: I was aware that Battle-Cars existed before, but had no idea until well after Rocket League’s release last July that the two were related. And yet they’re almost the same game. 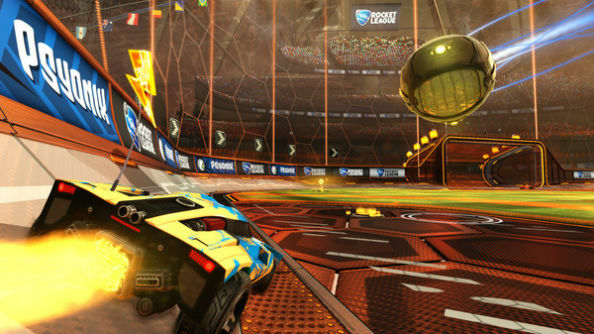 Compared to its lesser-known predecessor, Rocket League is a far more refined experience. Gone are the perfunctory facades and at times complicated guidelines of old, and in their place are simple rules, a simple premise, and a simple goal. 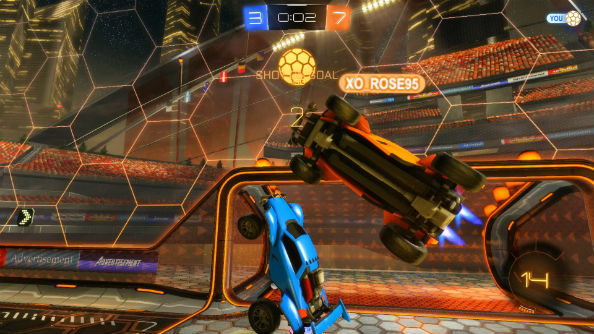 Mastering the art of the double-jump, or nailing a mid-air volley can demand hours of practice, yet what makes Rocket League so special is its accessibility: it welcomes first timers with the same enthusiasm as returning veterans. Interestingly, Battle-Cars started out on a completely different path, thus Rocket League as we know it today might never have existed. 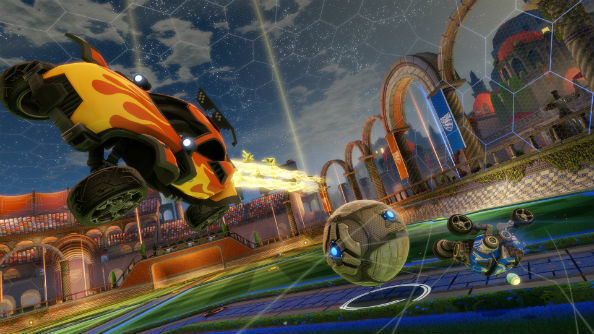 “One day we threw a ball into the map with us,” says Silloway, recalling time spent playtesting Rocket League’s older sibling the best part of a decade ago. “We were playing a game of hitting it around and we ended up deciding that was way more fun than the other game that we were playing. We just kept playing that game over and over in our playtests and it was actually taking away from the work we were doing on the vehicular combat game. Founded by Dave Hagewood at the turn of the millennium, Psyonix spread itself between work on the ill-fated Vampire Hunter: The Dark Prophecy, and Unreal Tournament 4. In the latter, Hagewood designed and prototyped vehicle physics in the game’s Onslaught Mode – a vehicle-oriented setting where you’d work to destroy the opposition’s power core to secure victory. With a deep understanding of the Unreal Engine, then, Hagewood’s ability to make cars tumble around enclosed arenas with a degree of believability, and with an appreciation of how to make this overall experience fun, laid the foundations for what would eventually become Battle-Cars. Silloway entered the Psyonix fray a couple of years later – nine and half years ago now, he says – by virtue of a competitive programming internship when the team comprised just Hagewood, Jerad Heck, Ben Beckwith and a few others. Although now over 40-members strong, only a select few made it through the internship process back then to form the team that shipped Battle-Cars. “When we came on board we already had some version of whacky car games going on,” he says, before they realised lobbing a ball into the fold would make for a far better game. While a community formed around Battle-Cars post release, undistinguished sales and reviews dealt Psyonix their biggest blow. They’d poured much effort into crafting a game they felt deserved more love and attention, however Silloway notes naive decisions made on marketing and promotional matters were likely what hampered the success of their first self-published release. “I think we always thought we had maybe made a couple of mistakes back then when Battle-Cars came out,” he says. “Especially with our decisions around marketing and we felt we weren’t really able to get the word of mouth out to enough people. Then again, the people that we did reach were really addicted to the game and then they saw the merits of the game that we saw: a game that was super fun and super addictive. Given the less than stellar reception Battle-Cars endured, remaking what was essentially a very similar game – self-publishing for a second time, starting over, pouring yet more blood, sweat and tears into something that might not succeed – was a gamble, to the point where Silloway recalls being unsure of how it’d go right up until release. Alpha testing on Steam seemed to have went well, however the decision was made to close it down in order to refine the issues players had flagged up during feedback. Similarly, beta tests pointed to burgeoning interest, yet, again, gauging just how much with any level of reliability was impossible. After all, many of the alpha and beta testers were members of the existing Battle-Cars community, thus Psyonix were altogether apprehensive. They’d been here before and understood the precarious balance between optimism and over-confidence. “We were trying to strike a good balance between the spirit and the feel of the original game while also making it a lot more accessible,” says Silloway. “Over the course of our development we were constantly going back and forth between the two extremes. Feedback from [experienced players] really helped us refine some of the controls and see what their reaction would be to it. Separating the wheat from the chaff became superlative to Rocket League’s development as Silloway and the rest of the team constantly iterated, streamlined and refocused what they’d made before. There was much scope to create a bigger and broader game but in the end paring it down became the real challenge. 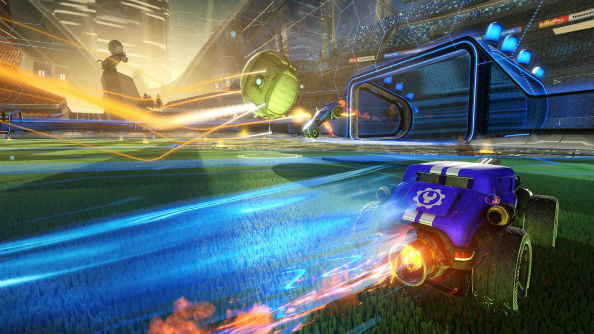 When Rocket League did eventually launch, it took off. When its forerunner had launched in 2008, YouTube was in its dawning years, social media had a far shorter reach than it does today, and streaming outlets such as Twitch didn’t exist whatsoever. 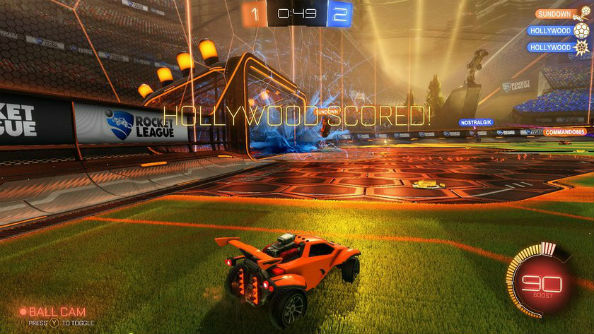 Fast forward seven years, and Rocket League’s fan base exploded almost overnight. 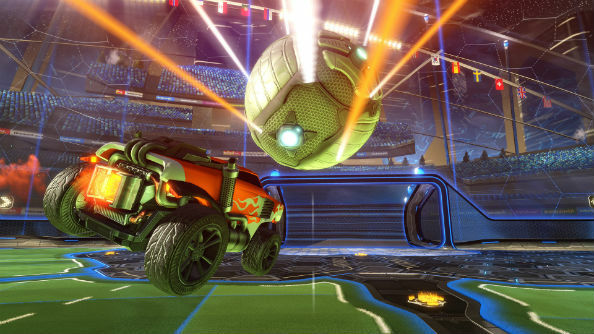 By the end of 2015, Psyonix’s breakout had been downloaded over eight million times and had accrued over $50 million worth of sales across all platforms. On YouTube, a whole subculture of players have since come together to perform, record and upload tricks and skills, acrobatics and great goals, and it seems this dedicated facet of the game’s fanbase are as committed to showing off their talents as they are playing the game itself. Another spectrum which has come to greater prominence since Battle-Cars’ release is eSports. Silloway admits the team hoped Rocket League would find its place within the competitive community, but that this prospect would be hinged upon interest – both in playing and spectating. “We didn’t want to force it,” notes Silloway. “But the stuff that’s come out of eSports so far has been spectacular and those players that are at the top tier do amazing things with the ball – stuff that I’d have no hope of possibly doing! It’s really cool to see all the eSports expanding and we have some really big plans this year we’re gonna make eSports awesome for Rocket League. We like that the game has become so popular so we’re chasing ideas that will help keep it in people’s minds, keep people talking about it, keep people playing. 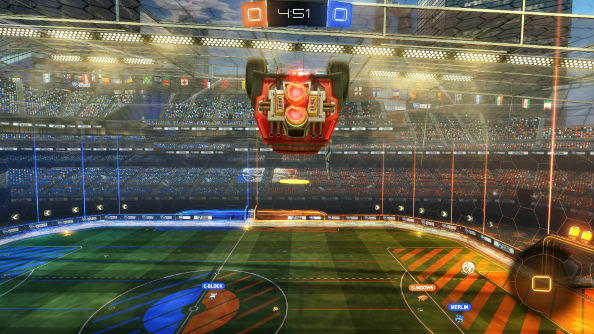 At its core, Rocket League is football (soccer) with cars. Many of the Psyonix team are sports fans, Silloway tells me, and many of them play in amatuer adult leagues around San Diego. Yet, even if you’ve no interest in football or sports in general, even if you hate sport altogether and have never watched a match in your life, there’s fun to be had in the cage. The incremental process of learning how to judge the physics of the oversized ball, of successfully shooting for goal for the first time, or of perfectly judging a high cross, is an incredibly rewarding process. Turning the game into a sport, as it were, allowed Psyonix to create structure: you have a team, you keep a score, there’s a time limit, there’s winners and losers – all of these factors inadvertently add to the fun of it all, even in the event of defeat. “You can hit the ball, you can score a goal in your first game playing against other people is really an amazing feeling,” says Silloway. “Especially when you start feeling out the controls and you realise, hey, there’s way more to the controls of this game than you’d originally thought. With online games, an extensive single player mode, battling friends, seasons, dressing up your car in the literally hundreds of customisation options at hand – that range from the sublime to the ridiculous – eSports, and mastering the art of airborne goals to be showcased on YouTube, Rocket League has plenty to offer. Why it’s found success this time round – or even why Battle-Cars failed to do so before – is likely down to timing. Silloway agrees, but remains convinced that they’ve simply managed to show the world what they knew to be true all along. “I think the biggest reason it’s been successful is just because it’s a great game,” he says. “We put all of our efforts into this game over the last three years, fully-focussed on it with our small team that was working on it. Even before that we’ve been thinking about the game since the prequel. Although failure did cross Silloway’s mind at times, the self-evident amount of effort he and the rest of the team put into finding success was always going to make the journey worth it. Luckily for Psyonix, Rocket League was a success. Luckily for us, they’ll continue adding to it for as long as there remains interest.